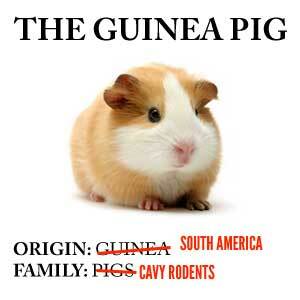 Because "South American Cavy Rodent" just doesn't have the same ring to it. "I was just thinkin'. About goldfish. Even though they are called 'goldfish' they aren't gold-colored, are they? They are red, right? The 'blue light' on traffic lights too, aren't they green? Things like that make me sick..."
Have you ever noticed how sometimes, pickles are really salty? That's the sort of thing this article would be about if it were a Self-Demonstrating Article. But it isn't. That would be silly. A birthday cake is a cake you eat on your birthday. That makes sense. But a butterfly is not a fly, a peanut is not a nut, and a ten-gallon hat can't even hold one gallon of liquid. Words or combinations of words like this whose meaning has nothing to do with their name are known as misnomers. Mostly for historical reasons the misnomer sticks and nobody—or almost nobody—bats an eyelid when it is used, since it is well accepted and people know what it means; this particular variant is a common result of calling Smeerps "rabbits". A Cloudcuckoolander character and punster tropers are likely to hang a lampshade on these from time to time, complain that contents of the tin differ from the label (or that the tin itself is not made of tin), and that there's no baby in baby food. When the name once fit but no longer does, see Artifact Title. If the name is itself an element of deliberate deception, it may be Doublespeak or a Super-Fun Happy Thing of Doom. For series with nonindicative names, see Word Salad Title and Never Trust a Title. For songs, see Non-Appearing Title. Fluffy the Terrible, Deathbringer the Adorable, Ironic Name, and Ironic Nickname are subtropes of this. Contrary to Exactly What It Says on the Tin. See In Name Only when this trope applies to the title of a derivative work. While explanations for misnomers are welcome and encouraged, please resist the urge to make a Justifying Edit. Looking to have fun with misleading names? See I Thought It Meant, for misleading trope names and I Thought That Was for misleading work names.